Cardboard, paper and plastics are commonly recycled, but some are easier to recycle than others. This section helps you understand how to identify these recyclable resources. Thermoplastics are permanently fusible and can be melted down and recycled. The reason why thermoplastics melt down so easily is because the molecules have a relatively weak attraction between the chains of molecules. Thermoplastic resins have molecules that are generally not cross-linked, meaning, the resin can be repeatedly melted and reused. Usually, no chemical change occurs when thermoplastic is cured. Thermoplastic resin usually starts out in solid pellet form, and changes shape with the addition of heat and pressure. Thermoplastic polymers are more widely used because of their flexibility, so there are, therefore, more of them. Thermoplastic polymers are known as acrylics (Polymethyl methacrylate), fluorocarbons (PTFE or TFE), nylons, polycarbonates, polyethylene, polypropylene, polystyrene, vinyls and polyester. Polyethylene terephthalate (PET) as Polyester. Thermosets are cured and will only char and break down. Thermoset molecules are formed by cross-linked chains of molecules further strengthened by chemical bonds. A thermoset is essentially one large molecule, without a crystalline structure. Thermoset resins generally come in liquid form, and when mixed with a catalyst, a chemical reaction occurs forming a solid. Thermoset molecules crosslink with each other during curing, thus once cured, they cannot change. Thermoset polymers do not equal thermoplastic polymers in quantity but they remain present within the manufacturing market. Thermoset polymers are known as epoxies, polyesters, silicones and phenolics. 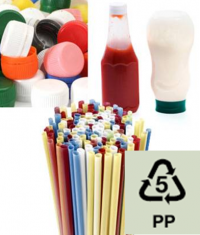 Polyethylene terephthalate is often used to make fibres (for clothing), parts made by injection moulding and containers for food and beverages, pharmaceuticals and make-up. There are several advantages in using PET. Especially when it's being used for packaging. PET does not break easily and edibles stored in PET taste good because it is pure. The substance also provides a long shelf life because it acts as a good barrier to elements outside of the container. Containers made from PET are also very lightweight and clear. Products look clean and pure because of the crystal clear appearance. Because PET is only 10% of the weight of an identical glass container, it allows for less expensive shipping and handling, saving a significant amount of money for companies around the world. saving a significant amount of money for companies around the world. 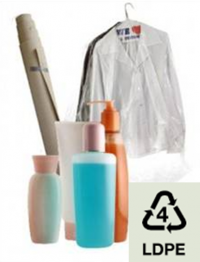 Products Made with Recycled Content - New Containers, Strapping, Carpet Fibres, Clothing, Cushion/Jacket Filling. Risks - PET poses a low risk of leaching. HDPE is defined by a density of greater or equal to 0.941 g/cm3. HDPE has a low degree of branching and thus stronger intermolecular forces and tensile strength. Risks - HDPE carries a low risk of leaching. PVC contains chlorine, so its manufacture can release highly dangerous dioxins. Products Made with Recycled Content - Piping, Kayaks, Carpet Backing, Packaging, Exterior Containers/Bins, Traffic Cones, Post Boxes. Risks - If you you get takeaways in plastic containers, chances are they're made out of PVC. Don‘t ever reheat your food in PVC containers or let the plastic touch food during cooking/reheating. Never burn PVC, because it releases toxins. LDPE (Low Density Polyethylene) is defined by a density range of 0.910 - 0.940 g/cm3. It has a high degree of short and long chain branching, which means that the chains do not pack into the crystal structure as well. It has therefore less strong intermolecular forces. This results in a lower tensile strength and increased ductility. LDPE is created by free radical polymerization. The high degree of branches with long chains gives molten LDPE unique and desirable flow properties. Typical Applications- Stretch Film (such as Cling Film and Glad Wrap), shrink Wrap, bubble wrap, zip-lock bags, grocery bags, squeezable bottles, and the coating of milk cartons. Products Made with Recycled Content - Rubbish Bin Liners, Floor Tiles, Compost Bins, Outdoor Furniture. Risks - As you may not know whether your cling/glad wrap is made out of PVC or LDPE, it’s best not to heat up your food with plastic wrap covering because harmful toxins could leach into your food, especially if it’s made out of PVC material. A thermoplastic polymer, polypropylene (also called polypropene) has properties between that of LDPE and HDPE and is one of the most versatile polymers available. Semi-rigid, translucent, good chemical resistance, tough, good fatigue resistance, integral hinge property, good heat resistance. Floats on water. Risks - No known health risks. Polypropylene has a high melting point, and so is often chosen for containers that must accept hot liquid. 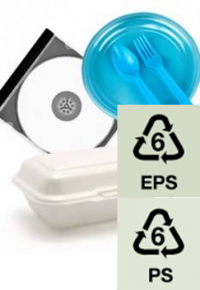 Numerical Code 6: Plastic Composition - Polystyrene (PS) and Expanded Polystyrene (EPS). To make an EPS moulding product, first the PS resin is impregnated with a blowing agent (Pentane Gas) to allow pre-expansion to take place (Polymerization). It is then re-expanded using superheated steam in a batch pre-expander to the required expansion ratio (can be up to 50:1) before it is conditioned in the silos for aging. The aged pre-expanded material is next fed into a moulding machine with a dedicated tooling where steam is used to expand the material within the mould cavities into the desired shape. Finally the parts are dried in ovens before they are inspected and packed for delivery. Properties - Great short shelf life moisture barrier, high optical clarity, good rigid structure, light yet stiff, low thermal conductivity. Typical Applications - Styrofoam Cups, Plastic Plates/Cutlery, Food Containers (e.g. sushi packs), Meat Trays, Protective Foam Packaging, CD Cases, Small Hard-wearing Bottles, Cable Spools, Toys. Polystyrene can be made into rigid (PS) or foam products (EPS – like Styrofoam). Products Made with Recycled Content - Light Switches, Plastic Mouldings, Packaging, Desk Trays. Risks - Evidence suggests polystyrene can leach potential toxins into foods. The material was long on environmentalists‘ hit lists for dispersing widely across the landscape, and for being notoriously difficult to recycle. These plastics are determined by the resins and combination of resins used in their manufacture. This is the catch all category of all other plastics. Many biodegradable, photo-sensitive, and plant-based plastics fit in this category. 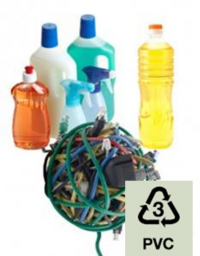 Basically any plastic that is not HDPE, LDPE, PET, PVC, PS or PP are put into this category. Additionally, any plastic resin type that has been developed since the original 6 resin types were established in 1988, are marked with the 7 or "Other" resin identification code. As such, listing common uses for these kinds of plastics is nearly impossible since their applications and characteristics are so diverse. Properties - Dependent on resins and combination of resins. Typical Applications - Milk/Fruit Juice Cartons, Oven Bags, Roofing, Cases. Products Made with Recycled Content - Low Grade Bottles and Outdoor Goods. A few are even made from plants (polyactide) and are compostable (refer to PLA details, below). Risks - Polycarbonate plastic is number 7, and is the hard plastic that is often present in children's toys and bottles, which has parents worried these days, after studies have shown it can leach potential hormone disruptors (such as BPA-Bisphenol A). This is a relatively new polymer derived from natural materials such as corn starch, tapioca or sugar cane. It is used as an alternative to conventional oil based polymers in a wide variety of applications including food packaging. The recycling code number is 7, as it does not fit into the first 6 categories. 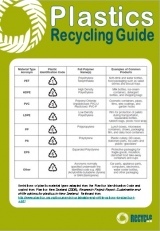 For most NZ recyclers, PLA cannot be considered recyclable or compostable through kerbside collection services. One of the key drivers for the use of PLA is its bio-degradable properties under the right conditions. When left exposed to natural elements, the PLA will also degrade but over a longer period. Packaging made from PLA may be able to be disposed of at a commercial composting facility that provides the perfect environment for the compostable material to breakdown. If a commercial composting facility accepts compostable packaging, the PLA packaging will need to be certified compostable to the Australian Standard AS 4736 or equivalent in order to be accepted at the facility. Despite the advantages of PLA, there are also some disadvantages. One of the most significant disadvantages is identifying the material within the waste stream. PLA has been engineered to look the same as its conventional alternatives meaning even to the trained eye, it's difficult to separate. Therefore, ensuring PLA does not contaminate other plastic grades can be very hard. The recycled PLA market also has a low commodity price and it presently costs more to ship a container of PLA overseas to a recycler than the actual material is worth. Therefore, it is not financially viable for some recyclers to begin sorting PLA for recycling. Additionally, the fact that PLA is made from biodegradable (i.e. organic) plant material, means that manufacture of this sort of 'plastic' actually ends up occupying valuable land space that could otherwise be used for food production. Paper and cardboard grades can be a challenge to identify for clean recycling. Some papers have aluminium or plastic coatings on them (usually for liquid containment, like boxed drink packs or coffee cups) and these are often unsuitable for recycling. Some materials are contaminated, especially with oil or grease, and these then become unsuitable, such as food containers. Some materials have better qualities than others, such as brightness, fibre length and tearability. Essentially, paper and cardboard are very fine man-made slithers of wood – forced to take these shapes using water, chemicals, heat and pressure. To ensure quality of product, all source recyclable paper and cardboard must be suitable for use with no impurities (especially any waxes or oils, and cross-contamination of Ground Wood and Wood Free paper stocks). This is why specialist recycling collection companies focus on separation, maintiaing product integrity is key. Mechanical Paper/Groundwood Paper is made from wood pulp that has simply been ground down. This type of fibre forms weak bonds and is used in paper made for temporary use such as newsprint. It is high in lignin which when exposed to light turns the paper yellow. 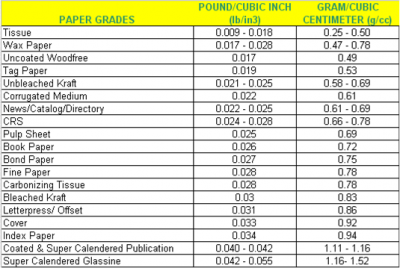 It is one of our lowest grades of paper. Wood Free Paper is made from a wood pulp that has been chemically treated and is free from wood impurities (our highest grades of paper, kraft, offset papers, whites, ledger). The process removes the lignum (wood glue) which holds the tree together. Due to this process this paper is known as being Wood Free paper, Printers predominantly use this paper. 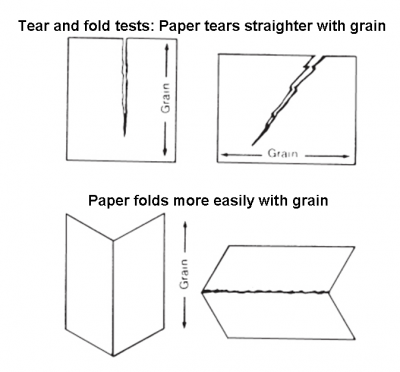 Grain affects paper in the following ways (these need to be considered in the proper use of paper): (1) Paper folds smoothly with the grain direction and roughens or cracks when folding cross-grain. (2) Paper is stiffer in the grain direction and (3) Paper expands or contracts more in the cross direction when exposed to moisture changes. In books and catalogues, grain direction should be parallel with the binding edge. If it is perpendicular with the binding edge, the pages turn less easily and do not lie flat. Paper for sheet fed offset is usually grain long. Moisture changes affect the shorter dimension and register problems are reduced. Brightness and Whiteness are two paper properties that are constantly confused by designers and others in the creative community. They are not the same; Brightness does not equate with Whiteness, or the reverse. Brightness is the measure of a paper's ability to reflect light. The higher the number, the brighter the sheet, which is rated on a scale of zero to one hundred. Brightness is the volume of light reflected off the sheet of paper. Think of the paper as a light bulb. Papers that are rated higher on the Brightness scale will allow the four-color process colors to pop more, appear more vibrant, enhance impact and create contrast on the page. Whiteness is the quality of light; it refers to the shade of the sheet of paper. The three major shades of paper are: balanced white, warm white and blue white. Most coated papers (and many uncoated papers, too) are currently manufactured to a blue white shade. To the human eye, the blue white shade appears to be brighter. And this is the reason for the confusion. Paper recycling is crucial for New Zealand. One tonne of paper saves 31,700 litres of water as much more is needed when using fresh wood. The whole conversion process takes less than an hour. There are 40,000 pieces of A4 paper in one tonne. More energy is saved as the need for grinding wood into pulp is decreased and fewer trees are felled. New Zealand relies on high export revenues from trees and we should reduce their conversion in to paper and cardboard. Please use the Contact Form to ask any questions you may have regarding this section of the recycle.co.nz website.